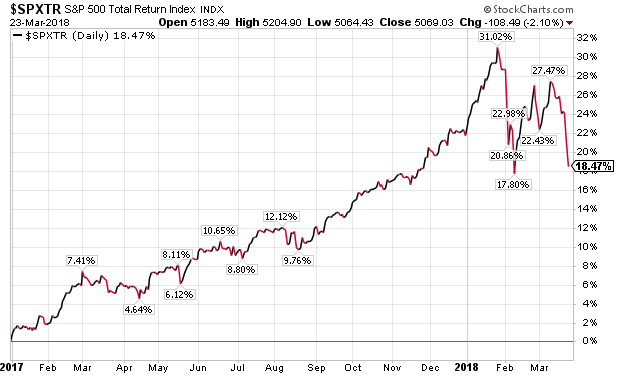 Even with the recent market weakness, on a total return basis, the S&P 500 Index is up over 18% since the beginning of 2017 and down just 2.76% year to date through Friday's close. Many of the indices are nearing important technical support levels. 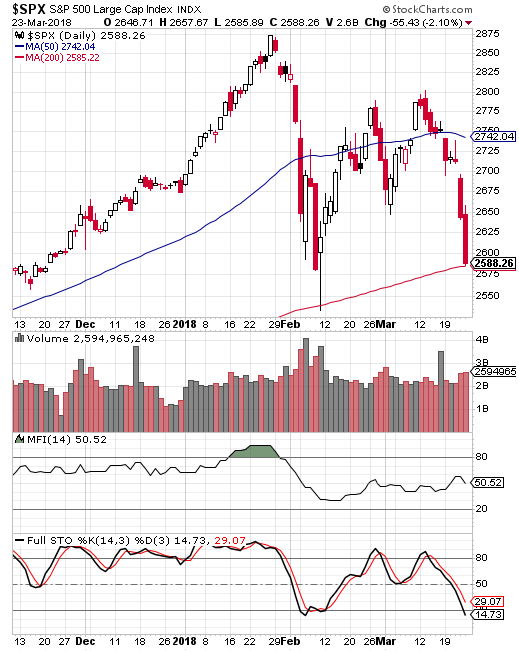 As can be seen in a number of the various index charts below, the closing price for each respective index falls just above its 200 day moving average. 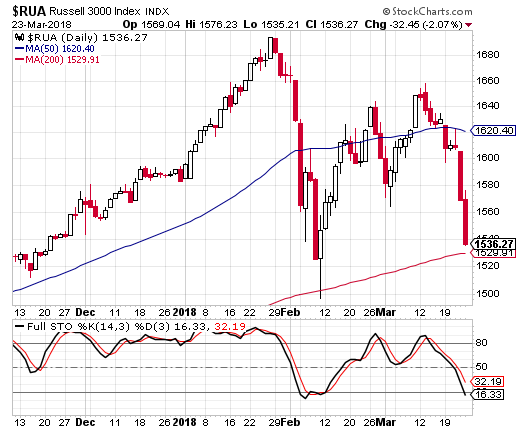 The market weakness that began in late January, and for the S&P 500 Index specifically, initially culminated in a closing low of 2,581 on February 8. After this past week, a retest of the February 8 low seems to be playing out with the market's close on Friday at 2,588. 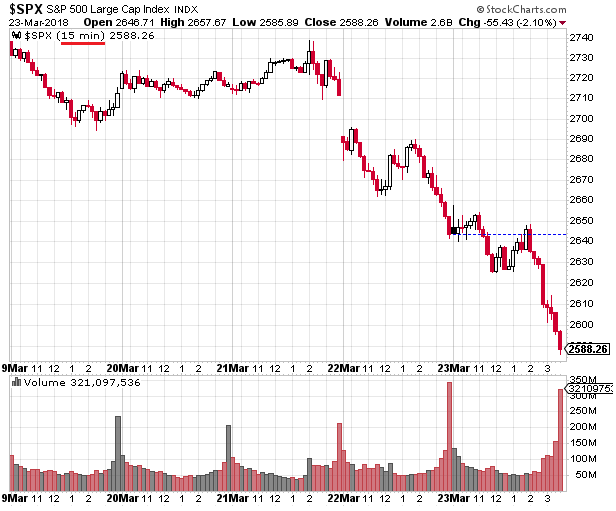 On a short term basis the indices appear to be oversold. 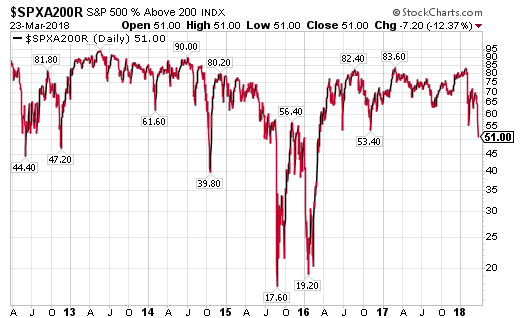 One measure to evaluate is the percentage of stocks trading above their 50 and 200 day moving averages. 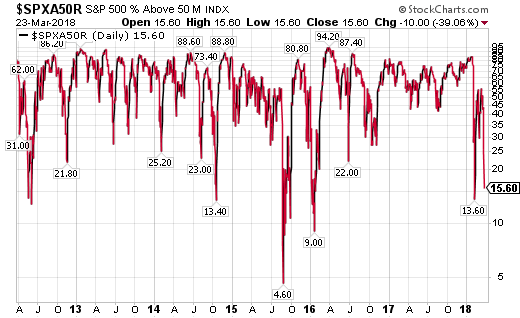 The first chart shows only 15% of S&P 500 stocks are trading above their 50 day moving average. 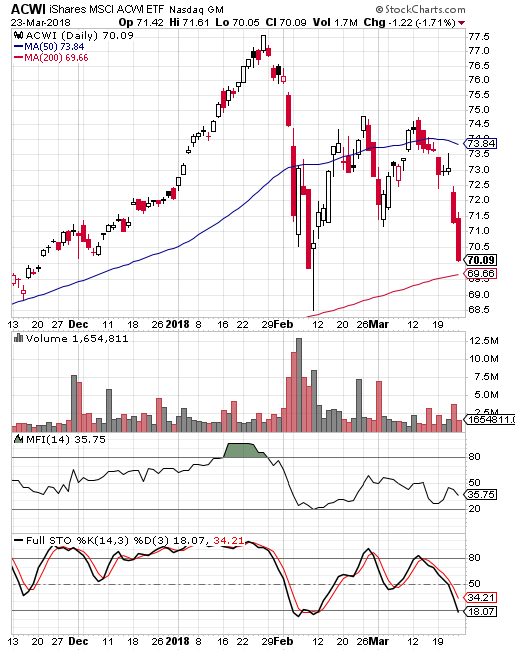 The chart shows that this measure can get reach the single digits, but mid to low teens is one indication of a short term oversold market. 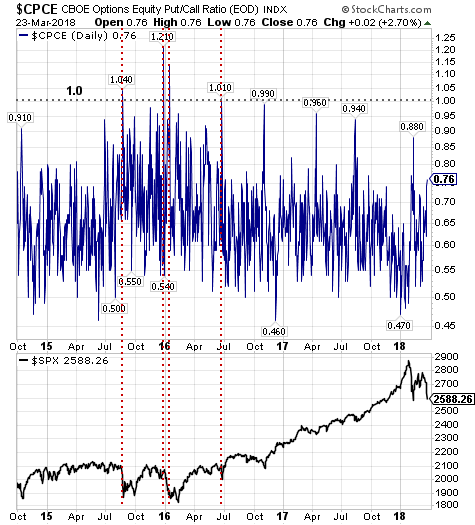 And lastly, on a sentiment basis, the equity only put/call ratio is elevated at .76, but not at a contrarian oversold level of 1.0 or higher. For readers, the equity put/call ratio measures the sentiment of the individual investor by dividing put volume by call volume. At the extremes, this particular measure is a contrarian one; hence, P/C ratios above 1.0 signal overly bearish sentiment from the individual investor. President Trump's tariff announcement against China was known well in advance. The idea of placing tariffs on China imports had been discussed for weeks and the White House even 'scheduled' a news conference with the specific focal point of announcing the tariffs. The dollar amount of the tariff was telegraphed in advance as well. I could touch on the Dowd and McMaster changes at the White House, but rarely are political events the result of sustained market weakness. We believe a potential cause for the recent market weakness is centered around the evaluation of recent economic releases, specifically in the Eurozone. Earlier this past week, the Eurozone Flash PMI was reported at 55.3 (still expansionary) but was below the estimate of 56.7 and was the second consecutive monthly decline. There are a number of reasons for the slowing in Europe, weather being one and supply and raw material shortages. In Germany, delays "are currently more widespread than at any time in the survey’s 22-year history." The strong euro is also negatively impacting Eurozone exports as well. Also contributing to the weaker expansion in the Eurozone is a declining trend in China's PMI. These lower PMIs remain expansionary; however, the slowing expansion deserves maintaining a keen eye on. And finally, the Fed rate increase was well telegraphed as noted above; however, the 10 year treasury yield has actually declined since the Fed's short term rate increase. The spread in early February (10 year Treasury yield minus 2 year Treasury yield) was 70 basis points and today it is 54 basis points. 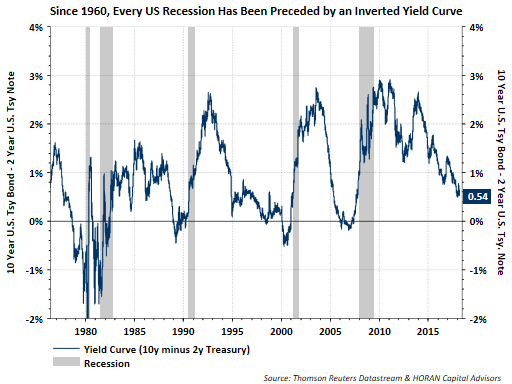 We do not believe an inversion of the yield curve occurs near term, where an inversion has a history of preceding a recession. I discussed this in a January article, Pullbacks Are A Normal Part Of A Bull Market. The equity markets have had a strong, low volatility run over the course of the last few years. This year investors are experiencing more normal levels of market volatility. The tariffs in and of themselves are likely a negotiating tactic by the Trump administrations. 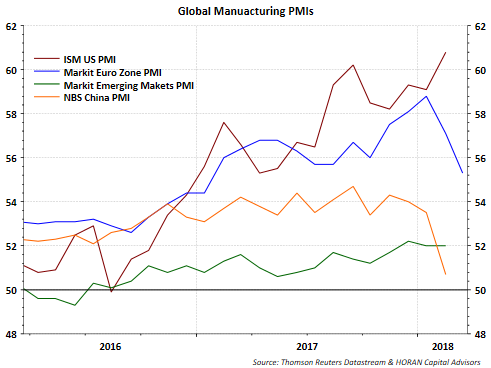 However, the slowing PMIs coming out of the Eurozone and China are worth keeping an eye on. 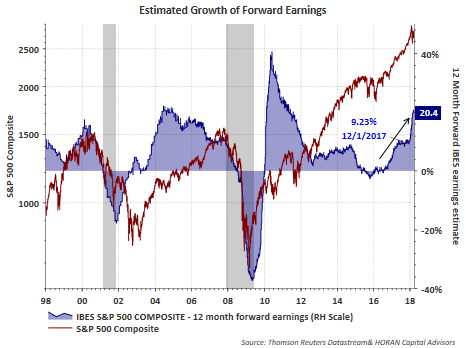 In the U.S. company fundamentals remain strong with forward earnings growth estimates continuing to increase. As the below charts shows, I/B/E/S growth expectations stand at 20.4%. The lack of fiscal discipline in Washington is a concern especially after an 8-year long economic expansion in the U.S. Yet, a majority of the economic data points continue to support continued economic growth along with a strengthening business sector. Some of the potentially weaker growing data points outside the U.S. are worth keeping at the top of one's list of variables to watch. And individual investor sentiment does not seem overly bearish, which would be a contrarian bullish signal. As a result more near term volatility in the equity market would not be a surprise. Longer term though, i.e., the balance of the year, we remain positive on future equity returns.